If I knew anything about alcohol, I’d compare Drinking Buddies to an ice cold brew: refreshing and momentarily absolving, but certainly nothing impactful in the long run. Guzzle too much and you’ll wake up with a dizzied demeanour, clutching at the faint straws of last night’s antics. You probably wouldn’t want to indulge these characters for too long either, else their credible charm will devolve into a more septic annoyance. Director Joe Swanberg finds an amiable balance though and subsequently delivers a film that is controlled despite its obvious air of improvisation. But much like that 11th beer, Drinking Buddies just doesn’t feel necessary. There is a gaping plot contrivance, one that’s really difficult to ignore. 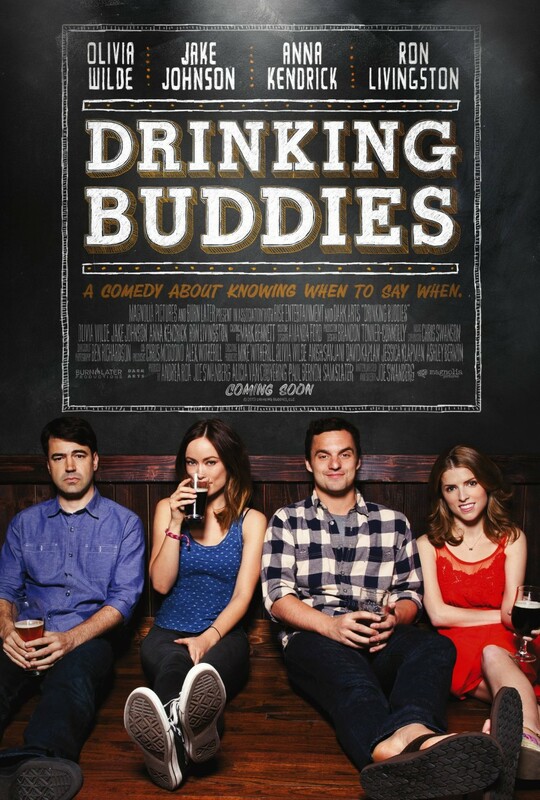 As co-workers at a Chicago-based brewery, Kate (Olivia Wilde) and Luke (Jake Johnson) spend more time with each other than they do their respective partners. The duo even manage to squeeze evening bar gallivants alongside other staffers into their laid back schedules. A double date weekend away ushers in a few new home truths — at least one more than we’re already aware of — whilst also cementing the obvious, that these two should be a couple. So why aren’t they? Drinking Buddies calmly shuffles along for 90 minutes and for at least 85 of those we ponder that exact sentiment. The notion promoting Kate and Luke as a terminally separate item is quite unbelievable, so much so that the amour scales eventually bowl over into absurdity. At its heart the film is a ‘will they, won’t they?’ story that seems destined for a conclusion within reach but beyond common sense. Kate and Luke are both drinkers, they’re both jokers, both laid back. The two even work at the same craft brewery. Better still, the duo’s respective partners are more suited to a relationship with each other as opposed to their current situation. Anna Kendrick is Jill, who likes to hike and muse over philosophical idioms. She’s not much of a bevy merchant. Inconspicuously, neither is Kate’s boyfriend Chris. The plot, though straightforward and immersive enough, struggles to overcome the grandiose fabrication staring it right in the face. We spent far too much time frustrated, pleading with the characters to face the overt facts. Not frustrated in an enticing manner, rather, gratingly so. It is a shame because Swanberg — who also wrote, edited and co-produced — drives home a genuine sense of believability when it comes to his characters. We recognise the people and we like them, but their situation is borderline nonsense. There is an impetus to improvise and, for the most part, a justifiable one. Although proceedings occasionally teeter down an overly spontaneous route where natural is irritatingly substituted in favour of awkward (a conversation during a mundane forest hike, for example) this mantra that puts the ball in the actors’ court is a welcome one. The indie tint is prevalent and actually very agreeable; visually, Drinking Buddies manifests as cosy if not at all flashy. Nor should it be flashy. The filmmaker squeezes a lot out of his $500,000 budget by tending towards simplicity, a decision that also coalesces neatly with Swanberg’s attempts to enforce purity. Much of what is happening hinges on the talents of Drinking Buddies‘ cast and they universally deliver. Olivia Wilde leads as Kate, constantly dawning shades in order to convince us she is hungover. Kate could easily be unlikeable — she is sort of clingy and relentlessly fails to take control of situations — but Wilde’s effortless allure grants her unlimited lives. Stepping away from the wrestling ring for a moment, Jake Johnson turns up as the other half of the film’s dynamic duo, Luke. Johnson has a slightly easier job than Wilde but delivers wholesomely nonetheless; Jake is cool (he has a beard) and eternally collected. The flick is at its most mobile when these two share the screen, their chemistry constantly sizzling. Anna Kendrick is also thrown in at the deep end — Jill is the character who is sort of ruining what inevitably would be a picturesque relationship. Yet, we still get along with her. Kendrick’s stock is on a rapid ascent and it is clear why. Simmering irrepressibly beneath the love quadrangle is alcoholism, a damning and serious issue. Though the tone fluctuates between frothy romance and light wit, the subject of alcoholism subconsciously rears every so often — it would, at the end of the day this is a piece about people working with drink and drinking after work — and Swanberg handles it well. He has to. Kate is definitely the serial gulp offender and it is consequently unsurprising that her personal life is the one falling apart. The director aptly manages said topic by raising awareness without stumbling into burdensome territory. There is no avoiding the almost fatal error in Drinking Buddies’ narrative. The film’s strive to be authentic butts heads with its stubbornness when it comes to characters’ romantic tendencies. Put that to one side though, and Joe Swanberg’s light-hearted indierrific outing will certainly quench your thirst. Ooo, a very divided, yet decisive review. This film made my top 5 of 2013, just to give you a sense of how much I love it ;). I thought it was a brilliant, light, heart-aching rom-com. I completely bought into the characters – Swanberg and company do so well to avoid tedium – but I just couldn’t get my head around the situation. Certainly admirable! Cheers Joseph. It’s such a delight of a movie that it made me feel as if I was hanging around a group of my own friends, just drinking and talking. Although it’s obvious that this group here was a lot more attractive and wittier than my own. Good review. Haha, don’t sell yourself too short Dan! 😉 Yeah, I liked the laid back atmosphere, it really worked. Thanks man. Love your review – really well written and some food for thought. I personally loved the film a great deal, largely due to it’s natural presentation. Everything just seems real. But I can certainly appreciate your take on it. For me it worked. Thanks mate. I’m with you on the naturalness, I think they got the balance spot on there. And I really like the characters too.